Reduced Rates for 2019 dates for Beautiful Estate w/ Pool, Pond, Barn & More! A beautiful, private and special estate on 60 acres that is perfect for family/friend reunions, special events and occasions. Don't miss out on your vacation at this special home. We only have a few openings left in summer 2019! Now available for short term rentals or long term leases. Great for all seasons, families, friends or special events! The Berkshire Country Estate is located on 60 acres in the foothills of the Berkshires within equal distance to the Hudson Valley. It is a large elegant, yet comfortable family Georgian estate with five fireplaces. Amenities include a gym, pinball, table tennis, air hockey, pool, pond, miles of walking and riding trails, library etc. If desired, indulge in an ultimate culinary experience and enjoy gourmet dinners of your choice prepared by personal chef. Children's menus available too. We also have a 4,500 square foot barn on the property, which offers a great additional space to hang out, and for events. Also, great for special events, weddings, birthdays etc with professional caterers and full event planning available, we'll work with you to design your 'perfect memories'. Grounds and lawn care, pool maintenance. Private, luxury, yet family friendly estate, the Berkshire Country Estate is a great destination, whether you are looking for cultural activities, hiking /nature experiences or just great "chill" time with family and friends. 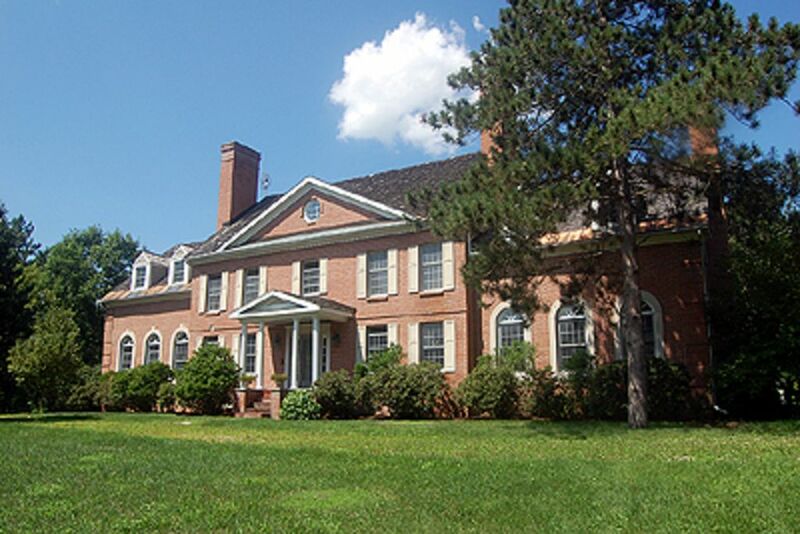 The estate is located on 60 acres with a 10 acre front lawn and 1/8 mile driveway set far back from the country road. You can relax in the beautiful in ground pool with no neighbors in sight, hike on the miles of trails, hang out in the 4500 square foot party barn for late night ping pong, foosball or dart tournaments...an additional entertainment level in the main house offers pinball, air hockey, indoor gym or movies. Shoot basketball or play volleyball, playset for the kids...or just relax in the hammock while listening to the sounds of nature. Feed the fish and bullfrogs in the pond. In winter, there are the 5 nearby ski resorts, ice skating and snowshoeing. Enjoy this year round camp for all ages and if you want to leave "campus", there's excellent restaurants, art galleries, antiques, theater, dance performances, museums and more! So much to do in the area, and if you can find the time, it's a short trip to Saratoga Springs or Cooperstown. We guarantee you won't be bored unless you want to be, and in that case, we'll provide the wine and hammock. Enjoy!!! Numerous books in library for use on site...children's library too! Pinball, air hockey, Theater with Netflix, card table. There is also a 4,500 square foot 3 season barn with ping pong, darts, tables & chairs, perfect for events or weddings under 75! Wonderful for families, friend/family reunions, special celebrations such as weddings, birthdays, anniversaries etc. Located on beautiful private 60 acre estate property with hiking trails. Pool, pond, children's play-set and a party barn too! Theater and Culture: The Berkshires offers many opportunities, and Hudson has some wonderful music venues. As we get closer to your stay, please let me know your interests, and I can offer some referrals. Golf: If you and yours golf, but there are many very good golf courses in the area, including the Cranwell in Lenox and Copake Lake in Copake, NY. Others are as nearby as a 6 minute drive! Miles and miles of hiking both in Columbia County and Berkshires. We are located on the Old Chatham Hunt Club Trails, so there are wonderful trails surrounding our property. Located two minutes up our road is a beautiful new site called Ooms Conservancy with a 35 acre pond. http://clctrust.org/public-conservation-areas/ooms/ Also Queechy Lake in Caanan is a beautiful 140 acre lake with a sandy beach. Cross country and snow shoeing on property. Wonderful berry and fruit picking at many nearby farms throughout Columbia County. June is berry picking season, and Fall is apple picking season! Try the Berry Farm in Chatham, Love Apple Farm in Ghent and Golden Harvest in Valatie. There are at least 5 nearby ski resorts that offer both winter and summer activities. Bousquet Ski Resort offers summer activities that include six waterslides, an activity pool, zip-line, 9-hole disc golf course, bungy -trampoline, climbing wall, bounce castle and Adventure Park ropes course. Catamount Ski Resort offers an aeriel adventure park with over 50 zip lines and 12 separate courses. Jiminy Peak Ski Resort additional activities include the Mountain Adventure Park, which has the alpine super slide, mountain coaster, hiking, and mountain biking.